Man of Light is a truly fascinating story about love, life, phenomena, and miracles. It is the true story of the famous Brazilian healer Mauricio Panisset, as told through the eyes of his wife Kimberly. Mauricio possessed a rare gift, the gift of light phenomena. Bright lights could be seen flashing like lightning, coming from various parts of his body when he did his healing work. These lights were beyond human comprehension. Mauricio used these lights to miraculously heal the sick and the dying, and to open others to a greater awareness of God and themselves. Dr Wayne Dyer says, "When I first walked into a room with him I immediately felt that he was radiating an extremely high energy from his body. He literally glowed with the high energy of light and love. Upon meeting him I was immediately placed at ease and I felt as if I were in the company of someone who could actually touch my soul." 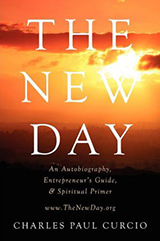 The New Day is the transformational life story of entrepreneur Charles "Chuck" Curcio, known for his unique and offbeat TV commercials as the Tire King, who parlayed a 500 dollar investment into fame, fortune, and the American Dream. The New Day is a book about God, a Manual of Spirituality and a Spiritual Handbook and Primer in which you will learn the truth and purpose of life: where you've come from, where you're headed, the spiritual gifts and abilities you possess, how you can develop and express them, and how to bring healing, harmony, and abundance into your life.